In 1912 the town of Lake Worth established its first Post Office and completed construction on a one-room school house. Their next priority was a place of religious worship. On November 25, 1912, families from the community gathered at the school. At least six denominations were represented, including Reverend McQuarrie, a Congregational minister, from Miami. It was decided that a non-denominational approach was needed and they subsequently adopted the name Union Church. On February 5, 1913, Rev. A.H. Shipman was called on to be the first pastor. For almost a year the congregation met in the one-room schoolhouse, and then on August 1913 worship services were moved to the newly completed “Clubhouse,” the site of the present City Hall. After many sacrifices, in February 1919 the Union Church complete its new sanctuary on the northeast corner or 2nd Avenue South and Federal Highway.In April 1921 the Union Church became affiliated with the Congregational Conference. 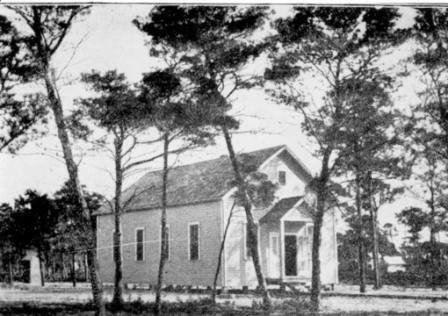 The congregation grew and the building was enlarged in 1925. In 1926 the first pipe organ in Lake Worth was installed in the new church. Pilgrim Hall was added in the 1930’s. In 1946, a new Church constitution adopted the name First Congregational Church of Lake Worth . Under ministers such as Rev. Lillian Fulton, D.D., who had the longest tenure as minister (1924-1939), the church grew. In addition to having the longest tenure, Dr. Fulton was also the first female minister and the first to attain a Doctorate of Divinity degree. To provide adequate facilities for the children and future generations, the First Congregational Church moved to its present location on North K Street. Dedication services conducted by Rev. H. A. Studebaker were held in November 1958. The church bell located on the east side of the sanctuary originally hung in the bell tower of the first church on 2nd Ave. The bell would be rung signaling the beginning and end of the church services and upon special occasions. The bell was brought from the old church and placed at its present location when the new sanctuary was built. The current wooden cross on the back wall of the sanctuary measures 18′ tall with a 6′ cross arm. In the 1980’s this cross replaced a glass-block cross embedded in the wall. The antique glass windows were imported from Germany, assembled in Zephyrhills, Florida, and installed inthe 1970’s. They include 12 panels with four scenes each that tell the story of Christ’s life. Seated in the congregation one can look at the panorama of his life shining through the windows lining both the east and west walls. The organ on our chancel is truly an exceptional instrument. 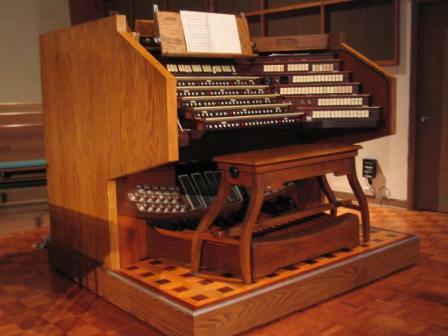 The 1,800 pipes were built by the Schantz Organ Company of Ohio and were installed in 1974. The five-section manual console was installed in 1990 by Allan Miller Associates of Connecticut. This console, built in 1977 by Fratelli Ruffatti of Italy, was formerly in the Crystal Cathedral in Garden Grove, California. The exterior of the console was completely reconditioned by Robert Ritcey. Located in the back of the sanctuary is the echo organ, donated to the church in 1992 by the Willet family. In 2002 the organ was dedicated to Robert Hebble in recognition for his 20 year of musical talent and service as organist for our church. The Baldwin piano is a nine-foot grand piano. Donated in 1990 by several members, the Baldwin is the choice of America’s foremost pianists, conductors, and composers. The instrument’s responsiveness and glorious tone make it a joy to play and inspiration to hear.